The score came on a short kick by defender Danny Califf when Sheanon Williams throw deep to the Dynamo side, talking them by surprise. While the Dynamo tried to regroup, Sebastian Le Toux shot from five yards out; hitting the crossbar. Califf got the ricochet and chipped it in for the game’s only score. The entire game was very physical, with three yellow cards issued in the game; Philadelphia’s Carlos Ruiz in the 20th minute for a reckless foul, and Houston’s Brad Davis (22nd minute) and Califf (44th minute) for reckless tackles. To start the second half, the game was lost on local television and monitors in the stadium as the power supplying the transmission truck went out and the signal was lost. It was back on line half-way though the second half. The Dynamo controlled the ball the majority of the game but could not find the way to put it in the goal. Numerous drives, break-a-ways and corner kicks failed to end in the desired result; that being a goal for the orange and white. The Union defense, much improved from 2010, kept the Dynamo at bay and forced them to take shot after shot that was easily defended or quickly knocked or head away. The best chance for the Dynamo came in the 67th minute when Brad Davis found Geoff Cameron on a free kick, but his hearer just missed the net. HOUSTON, TEXAS As the Houston Dynamo prepare to kickoff their final season at Robertson Stadium, the question among fans (and media alike) is if they can return to the form that brought them two consecutive MLB Cups. Their first test of 2011 will be against the Philadelphia Union, a team that beat Houston in the first game ever between the two teams; 3-2 on May 29, 2010 in Houston. In their second match, they battled to a 1-1 tie on Oct. 2. The Dynamo will have a younger look this season, with 40% of the squad yet to play in an official game. Against the Union, the Dynamo will start Tally Hall, with Jason Garey and Will Bruin slated to start at the forward position. On defense, head coach Dominic Kinnear will go with Hunter Freeman, Bobby Boswell, Jermaine Taylor, and Andre Hainault. Rounding out the starting line up against the Union will be Corey Ashe, Geoff Cameron, Lovel Palmer, and captain Brad Davis at midfield. The Union will counter with captain Faryd Mondragon in goal while Carlos Ruiz and Sebastien Le Topux filling the forward spots. Kyle Nakazawa, Brian Carroll, Stefani Miglioranzi and Justin Mapp will start at midfield. On defense, Carlos Valdes, Jordan Harvey, Sheanon Williams, and Danny Califf will start. For the Dynamo, midfielder Colin Clark is unavailable with an injured left knee. Forward Brian Ching is listed as doubtful. Union defender Juan Diego Gonzalez is listed as questionable with a left hip flexor strain. HOUSTON, TEXAS (March 19, 2011 ) University of Houston head swimming coach Mark Taylor passed away late Friday evening of an apparent heart attack in Austin, Texas. His wife, Lorraine, and his two sons, Troy and Zane, survive Taylor, 50. 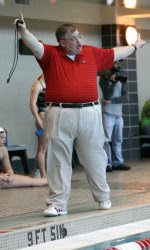 Taylor had just completed his ninth season as head coach for the Houston swimming team. He saw great success at UH with seven top-30 NCAA finishes — 2009 (17th), 2008 (28th), 2007 (23rd), 2006 (23rd), 2005 (20th), 2004 (22nd) and 2003 (20th). 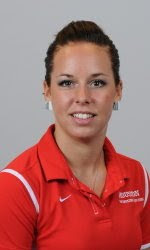 Taylor came to Houston after some years in international swimming, coaching teams in Denmark and Iceland. He coached in the 1996 Olympic games for Lithuania as well as the 1993 European Championships. Taylor also served as an assistant coach at Arizona State for five seasons. Funeral and visitation arrangements are being made and will be released when finalized. WACO, TEXAS (March 18, 2011) The University of Houston women’s basketball team wrapped up a busy Friday as they continued preparations for its NCAA Tournament First Round matchup against West Virginia on Sunday afternoon. Making their fifth trip to the NCAA Tournament in program history, the Cougars will meet Big East Conference member RV (AP)/#25 (Coaches) West Virginia at 4:10 p.m., Sunday, inside the Ferrell Center in Waco, Texas. Fans can hear that game live on UHCougars.com with Jeremy Branham calling the play-by-play action and Rusty Laverentz providing analysis. Fans also can watch the game live on ESPN2 with Pam Ward calling the play-by-play and Stephanie White as analyst. Following a two-hour practice inside Hofheinz Pavilion on Friday morning, the Cougars hopped on a bus for the two-and-a-half hour trip to Waco. Before they left, first-year head coach Todd Buchanan, his coaching and support staffs and the Cougars were greeted by fans, the Cougar Brass and Houston Athletics Department staff members. After unpacking and settling into their hotel rooms, the Cougars enjoyed an early dinner at a local restaurant and returned to the hotel for a good night’s sleep. On Saturday, the Cougars will enjoy their first taste of March Madness since 2005. While Buchanan and his support staffs with work through early morning administrative meetings, the Cougars will visit the Ferrell Center at 10:45 a.m., Saturday. AUSTIN, TEXAS (March 18, 2011) University of Houston senior All-American diver Lacey Truelove won the 3-meter consolation finals on the second day of the NCAA Championships, Friday at the Lee and Joe Jamail Texas Swimming Center. Truelove erupted for a personal best score of 381.45 mark in the finals to take the top spot over second place Deidre Freeman (370.65) of Iowa. The Cougar senior advanced to the consolation finals following a 15th-place performance in prelims with a score of 313.90. Sophomore Julia Lonnegren's score of 267.75 was good for 29th place in the preliminary round. Saturday's final day of competition will feature Truelove's specialty, the platform diving event. The London, Ontario native will look to become a three-time All-American in the event, as she reached All-America status in the platform in 2008 and 2010. Preliminaries are scheduled for 1:30 p.m. and finals will begin at 7 p.m.
AUSTIN, TEXAS (March 17, 2011) University of Houston sophomore diver Julia Lonnegren placed 28th in the 1-meter competition at the NCAA Championships hosted by the University of Texas Thursday. After advancing to the national championships for the first time in her career last weekend at the NCAA Zone D Championships, the Cougar sophomore posted a score 254.70 to place 28th in the preliminary round at the Lee and Joe Jamail Texas Swimming Center. Senior All-American Lacey Truelove did not compete in the 1-meter competition, but will join Lonnegren Friday in the 3-meter championships. Truelove qualified for the NCAAs after winning the Zone D Championships in the 3-meter event last weekend. HOUSTON, TEXAS (March 17, 2011) The University of Houston baseball team will look to extend its two-game win streak this weekend whenthey play host to Kent State at Cougar Field. It will mark the first ever meetings between the two programs on the baseball field. The series begins at 6:30 p.m. Friday, continues at 6:30 p.m. Saturday and concludes at 1 p.m. Sunday. Fans can hear all of the weekend’s game action live on UHCougars.com through the online radio link and livestats will also be available via the internet by clicking on the Gametracker link on the baseball schedule page. A live video stream of each game will be available on the All-Access page of the Houston website. Houston’s series against Kent State will be the last home contest during the month of March as the Cougars kick off a nine game road stand next week. The road trip includes two midweek games against Rice, a midweek game against Texas A&M and weekend series against TCU and Tulane. The Cougars are 9-9 this season after winning games against Sam Houston State and McNeese State this week. Junior Matt Creel leads the team with a .413 batting average. The designated hitter has six doubles, a triple and 13 RBIs. Senior Caleb Ramsey leads the team with ninedoubles and 25 RBIs. Kent State enters the weekend with an 8-6overall record after knocking off Pittsburgh, 10-7, Tuesday night. Ben Klafczynski paces the team with a .439 average. He also has three doubles, a triple, four home runs and 13 RBIs. As a team the Golden Flashes are hitting .266 with 24 doubles, nine triples and seven home runs. Junior Mo Wiley will be making the start for the Cougars on Friday night against the Golden Flashes. He is 0-1 in one start and four appearances. Wiley posts a 6.14 ERA with four strikeouts. Kent State will send Andrew Chafin to the mound in the opener. He is 2-0 this season in three starts. Chafin has also not allowed a run in 19.2 innings and has 19 strikeouts. Houston has not named starters for Saturday and Sunday’s games. The Golden Flashes will start Kyle Hallock on Saturday. He is 2-2 in four starts with a 2.25 ERA. In 24 innings of work he has allowed six earned runs with 17 strikeouts. In the finale, Kent State has named DavidStarn as its starter. He is 2-1 with a 0.93 ERA in four starts. Starn has pitched a team-high 29 innings and has a team-high 26 strikeouts. SPRINGFIELD, MISSOURI (March 11, 2011) The Rice Owls played hard and hustled but it was not enough, as Missouri State defeated Rice 76-65 in the Women?s National Invitational Tournament at the JQH Arena in front of 1,459 fans. The Owls end their season at 18-14, while the Lady Bears improve to 24-10. Rice?s Jessica Kuster posted her 13th double-double of the season with 15 points and a game-high 11 rebounds. It was the Owls 10th post-season appearance and seventh in the WNIT. It was also the third WNIT appearance for the program under head coach Greg Williams. Also in double-digits for Rice was sophomore guard Jessica Goswitz with 13 points and Morgan Mayse with 12 points. Mayse also had 6 rebounds and D?Frantz Smart scored 8 points. The Lady Bears received 18 points from Casey Garrison, while Whitney Edie and Lacey Bosche scored 13 points each and Christiana Shorter added 12 points. Garrison also had 9 assists and 8 rebounds. It was a tight game in the first half with both teams trading baskets. Morgan Mayse hit a jumper and a long trey to tie the game at 14. The Owls then recaptured the lead (20-18) when Mayse once again drained a three-pointer and Elliott scored on a driving lay up. Rice went up five (25-20) on a jumper by Amenemope McKinney with the one tick on the shot clock and a three-pointer by D?Frantz Smart on the left wing. The Owls were up 34-30 (2:37) after Kuster canned her fourth basket, a jumper near the top-of-the-key. The Lady Bears then closed the half on a 7-0 run to forge a 37-30 half-time lead. Rice made 5-9 from three-point for 55.6 percent and shot 40.6 overall (13-32). Missouri State shot 50 percent from the field (16-32) and was 0-4 from three-point range. The Lady Bears opened the second half on an 8-2 run for a 45-36 lead. A free throw by Memri Carmon and a trey by Carmon brought the Owls back to 45-40. A trey by Elliott brought Rice to within two at 58-56. Missouri State then countered with a basket down low and a three-pointer from the left wing. Goswitz made two free throws and three-pointer to bring the Owls close once again at 63-61 (3:48), but the Lady Bears went on a 13-4 run for the final 76-65 margin. The Owls only shot 30.3 percent (10-33) and 3-11 (27.3 percent) from three-point range in the second-half. Rice finished at 35.4 percent overall from the field. Missouri State finished at 46 percent (29-63) after making 13-31 in the second-half (41.9 percent). GOODYEAR, ARIZONA (March 17, 2011) Freshman Jesse Droemer fired a 1-under-par 71 in the first round of the Desert Shootout to lead the University of Houston golf team Thursday. With a team score of 292, the Cougars stood in 13th place through the first day. Droemer was the only Cougar to shoot under par on the 7,015-yard, par-72 course at Palm Valley Golf Course during the first round. Freshmen Bryn Flanagan and Wesley McClain were tied for 53rd after shooting 73s, while freshman Curtis Reed wastied for 71st with a 75. Sophomore newcomer Will Dusenbury was tied for 83rd with a 77. Oklahoma posted ascore of 274 to finish the first day two strokes ahead of TCU and three shots ahead of Saint Mary’s, BYU and Iowa State. North Texas (280), Tulsa (281), VCU (282), Southern Utah (282) and Wyoming (283) rounded out the top-10 team leaders. North Texas’ Carlos Ortiz, Zachary Blair and Cameron Edens of BYU and Oklahoma’s Abraham Ancer were tied for the first-round lead after shooting 66. The second round resumes at 8:30 a.m. (CST), Friday, with players teeing off from holes No. 1 and No. 10. The final round begins at 8:30 a.m. (CST), Saturday, with a shotgun start. Following the Desert Shootout, the Cougars play host to the Border Olympics on March 25-26 in Laredo, Texas. Houston will welcome Air Force, Arkansas, Baylor, Lamar, Liberty, Kansas, Kansas State, Rice, New Mexico State, Indiana, UT Arlington, UTSA, North Texas, Oklahoma, Toledo, Wichita, Washington State and Texas State. HOUSTON, TEXAS (March 14, 2011) It is that time of year again; the 2011 NCAA Men's Division 1 Basketball Tournament. During the past five years, I have posted my picks during each round. This year will be no different. So, without further ado, are my picks for the first round (my picks are in italics). The Houston Cougars (7-5, 0-0 C-USA) split two single games at home in midweek action before heading on the road for a series against the Texas State Bobcats. On Tuesday night, the Cougars fell to the McNeese State Cowboys (8-6, 0-0 SLC), 10-2. The Cougars could only manage three hits in the game and committed three errors. They sent four pitchers to the mound, with starter Datota Dill facing nine batters in a mere 1.2 innings, giving up two runs, both earned, and no hits while walking four. His relief, Taylor Hammack, was not much better, facing 24 batters and giving up six runs on nine hits in 4.2 innings. In the second game of the brief homestand, they downed Texas Southern, 13-2. The Cougars had 17 hits, including six doubles and a triple against the Tigers. The hit total was the team's highest since recording 18 hits on opening day. John Cannon led the way, going 2-for-2 with a double and two runs scored. M.P. Cokinos added three hits, while Chase Jensen, Jake Runte and Matt Creel each had two. In his first career start, Jordan Mannisto pitched 3.2 innings. He gave up two unearned runs on five hits with three strikeouts. Luke Moran improved to 1-0, pitching 3.1 scoreless innings with three strikeouts. Chase Wellbrock and Creel each added an inning of relief. In the three-game series against Texas State, the games will start at 6:30 p.m. on Friday, continue at 2 p.m. Saturday and conclude at 1 p.m. Sunday. HOUSTON, TEXAS (March 8, 2011) Coming off a 1-2 record at the 2011 Houston College Classic, the Houston Cougars (6-5, 0-0 C-USA) welcome the McNeese State Cowboys (7-6, 0-0 Southland) to Cougar Field with a 6:30pm start. The match up will be the first of two games in which the Cougars face the Cowboys. They will face off again on Mar. 16 in lake Charles, La. The Cowboys are coming off a three game sweep over Houston Baptist, downing the Huskies 11-2, 4-3, 4-3. The Cougars will start with Dakota Dill (0-0, 1.08 ERA) with the Cowboys sending Jaden Dillon (0-2, 9.64 ERA) to the mound. The right-handed Dill has made five appearances this season, pitching 9-1 innings, giving up one run on nine hits while striking out eight and walking two. Dillon has made three appearances with two saves in 2011, giving up 11 runs on 17 hits and striking out seven. I will have a game recap and stats at the end of the game. HOUSTON, TEXAS (March 6, 2011) Scoring a single run in the top of the eighth inning, the Kentucky Wildcats (5-6, 0-0 SEC) broke the 1-1 tie and held on to down the Utah Utes (2-6, 0-0 MWC), 2-1 in the third game for both teams at the 2011 Houston College Classic at Minute Maid Park. Catcher Michael Williams singled to the left side on a 1-0 pitch to score Braden Kapteyn from third for the winning run. Utah got on the board first in the bottom of the first when short stop James Brooks scored from third on a sacrifice line out to left field by first baseman C.J. Cron. Kentucky evened it up in thee top of the fourth when Kaptlen scored his first run of the game on a Brian Adams single down the third base line. Jordan Cooper got the win for the Wildcats, going seven complete innings giving up one earned run on three hits and striking out nine. Trevor Gott, pitching two innings, was crediting with the save. Josh Chapman, pitching 3.1 innings of relief got the loss. 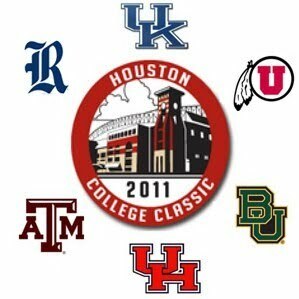 Kentucky leaves the 2011 Houston College Classic with a 1-2 record and will face Eastern Kentucky at home on Tuesday evening. Utah posted a 2-1 record in their first appearance at the Classic. They will now head to the west coast to play UC Davis on Thursday evening at the Jack Gifford Memorial Tournament in Santa Clara, Calif.
IRVING, TEXAS (March 6, 2011) The league's best players were honored Sunday as Conference USA unveiled its 2011 Women's Basketball All-Conference Teams. A trio of Houston standouts received recognition while Memphis and Rice also tallied honorees. Brittney Scott, Courtney Taylor and Porsche Landry all represent the Cougars on the list along with Memphis' Brittany Carter and Rice's Jessica Kuster. or broken down to feature all 12 C-USA coaches individually. HOUSTON, TEXAS (March 5, 2011) The Houston Cougars (6-4, 0-0 C-USA) snapped its three-game losing streak by downing the Kentucky Wildcats (4-6, 0-0 SEC) 8-5 in the second game for both teams at the 2011 Houston College Classic. The Cougars came back from a 2-1 deficit in the top of the seventh inning, scoring six runs to take a 6-1 lead. The Wildcats scored a single run in the bottom of the inning and pulled within two in the bottom of the eighth, scoring two more runs. Houston scored another run in the top of the ninth to insure the three-run victory. UH drew blood first in the top of the first inning on a single by Caleb Ramsey which scored London Appling from second. Kentucky came back with a two-run inning in the bottom of the fourth, scoring Chad Wright on a Luke Maile home run. Maile took a 1-0 pitch from Houston pitcher Jordan Lewis, knocking it into deep left field for the two RBI round trip. Houston then uncorked the bats in the top of the seventh, scoring six runs on seven hits; leaving two men on base after the hitting exhibition was over. Jake Runte led off the inning with a single and advanced to second on a fielder’s choice. M. P. Cokinos was called in to pinch hit for Travis Trial. He quickly singled up the middle scoring Runte from second. Joel Ansley was then substituted as a pinch runner for Cokinos. John Cannon then tripled to right field, scoring Ansley, followed by Landon Appling reaching first on a fielder’s choice. After Cannon was thrown out at home by Wildcat shortstop Taylor Black, Appling stole second base and advanced to third on a wild pitch. Ryan Still also advanced to second on the wild pitch, after being walked. Ramsey then singled through the right side, scoring both Appling and Still. Matt Creel got in on the assault with a single, advancing Ramsey to second. Chase Jensen also hit a single advancing Creel to second and scoring Ramsey. Runte got his second hit of the inning, connecting for an RBI single to scoring Creel to compete the scoring explosion. Kentucky scored one run in the seventh and two more in the eighth to cut the Cougars lead to two, followed by a Houston insurance run in the ninth. Creel, who came into the game in relieve of starter Jordan Lewis got the win, throwing two complete innings giving up two runs on four hits while striking out one. Lewis went five complete innings, giving up two earned runs and three hits. Dakota Dill was credited with the save. For the Wildcats, Alex Meyer got the loss, giving up four earned runs on five hits while striking out six. The Cougars will next face Texas A&M in a 6:00pm start on Sunday evening to close out the Houston College Classic. Kentucky is slated for a 11:00am start against Utah on Sunday morning. HOUSTON, TEXAS (March 4, 2011) The Utah Utes came into the 2011 Houston College Classic with a 0-5 record to begin their 2011 season. They left the field at Minute Maid Park after 2.5 hours and came away with their first win of the season; a 2-1 victory over No. 9 Texas A&M. The Utes (1-5, 0-0 MWC) took the lead in the top of the seventh inning on an RBI single by outfielder Shaun Cooper, driving in outfielder Galvin Green. Utah took the early lead in the top of the first when shortstop James Brooks led off the game with a double. First baseman C.J. Cron then drove him in with an RBI single. The Aggie came back in the fifth inning to tie the game with a sacrifice bunt by center fielder Krey Bratsen, which scored third baseman Adam Smith. Rick Anton received the win for Utah, going seven complete innings giving up five hits and one earned run while striking out eight. In one inning of relief, Nick Fleece was charged with the loss. Utah will next face Baylor at the 12 noon Saturday game while the Aggies will face Rice at 7 pm. HOUSTON, TEXAS (March 4, 2011) The Baylor Bears (5-4, 0-0 Big 12) downed the Houston Cougars (5-4, 0-0 C-USA) by a score of 5-2 to kickoff the 2011 Houston College Classic at Minute Maid Park in Houston. The Bears scored their five runs on nine hits, while the Cougars could manage only two runs on eight hits. The game saw a total of six errors committed—two by Baylor and four by Houston. Pitcher Logan Verrett allowed only one earned run in 6.2 innings in the Baylor win. Third baseman Jake Miller went 3-for-4, along with scoring a run. For the Cougars, left fielder Jake Runte went 3-for-4 and scored both of Houston's runs. Trailing 3-0 in the bottom of the fifth, Runte got his first hit of the game, a single down the left field line. He stole second base before scoring on Ryan Still's RBI single down the left side. Baylor then took advantage of two Cougar errors in the sixth inning, allowing two runners to score to give the Bears a 5-1 lead. Runte scored his second run in the bottom of the seventh inning on a John Cannon sacrifice fly to center field. The Bears will next face Utah in a 12 p.m. game on Saturday, while the Cougars will take on Kentucky in the 3:30 p.m. game. Senior Writer Robert H Kelly has written a preview slide show on the 2011 Houston College Classic to be played at Minute Maid Park in Houston on March 4-6. It is currently featured on Bleacher Report. Readers can view the slide show here.